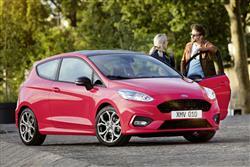 Ford expects demand for its Fiesta ST-Line supermini warm hatch to be strong. Jonathan Crouch looks at what's on offer. Most commentators agree that the Fiesta ST is the hot hatch to have in the junior shopping rocket segment. If you've decided that too, but concluded that the costs involved are just that little bit beyond you, then these ST-Line models offer a very tempting alternative. Yes, there's less power, but the handling promises to be very nearly as good - and possibly in some circumstances even better - than Ford's established class leader. Plus there's the advantage of being able to order the more practical five-door bodystyle. Go on. You know you want to.